Get ready for the world's most exciting taxi ride ever! 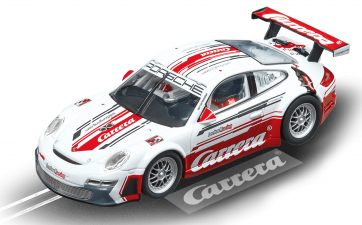 The cooperation with "Lechner Racing" has enabled Carrera to give motorsports fans the unique opportunity to take their passion out onto a real racetrack. The "Lechner Racing" Race Taxi gives participants a chance to whizz around the famous Salzburgring next to a real pro driver. The dream of experiencing the real sensation of motor racing excitement will be coming true for several fans. As a memento for those who don't get the chance to enjoy their own taxi ride, and for the fans that can't make it to the Salzburgring, Carrera has produced the Race Taxi for home-based racetracks in the classic Carrera colours red, white and black.